Salinity is a key abiotic property of inland waters; it has a major influence on biotic communities and is affected by many natural and anthropogenic processes. Salinity of inland waters tends to increase with aridity, and biota of inland waters may have evolved greater salt tolerance in more arid regions. Here we compare the sensitivity of stream macroinvertebrate species to salinity from a relatively wet region in France (Lorraine and Brittany) to that in three relatively arid regions eastern Australia (Victoria, Queensland and Tasmania), South Africa (south-east of the Eastern Cape Province) and Israel using the identical experimental method in all locations. 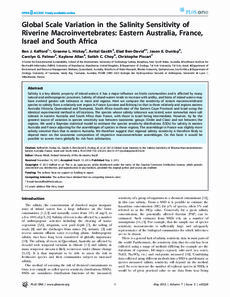 The species whose salinity tolerance was tested, were somewhat more salt tolerant in eastern Australia and South Africa than France, with those in Israel being intermediate. However, by far the greatest source of variation in species sensitivity was between taxonomic groups (Order and Class) and not between the regions. We used a Bayesian statistical model to estimate the species sensitivity distributions (SSDs) for salinity in eastern Australia and France adjusting for the assemblages of species in these regions. The assemblage in France was slightly more salinity sensitive than that in eastern Australia. We therefore suggest that regional salinity sensitivity is therefore likely to depend most on the taxonomic composition of respective macroinvertebrate assemblages. On this basis it would be possible to screen rivers globally for risk from salinisation. © 2012 Kefford et al.